Check out these Administrative Assistant resume templates and resume builder from Live Career. 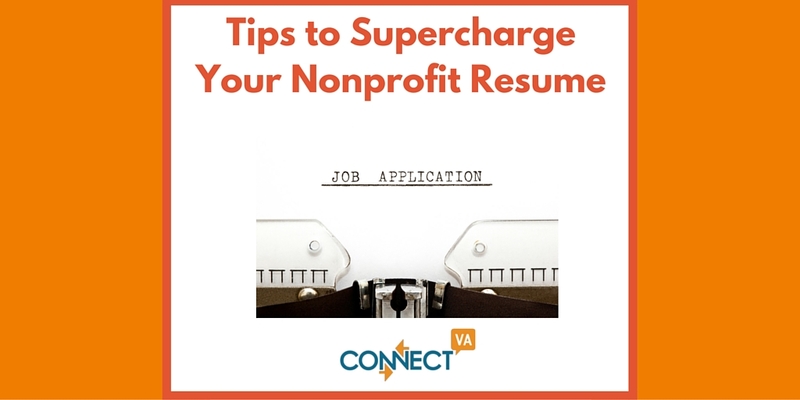 Though your role will vary based on the organization and department you support, here are some general nonprofit keywords to consider using in your resume: Research, Communications/writing, Passion for the (specific) mission, and more. Mazarine Treyz of Wild Woman Fundraising has some free fundraising webinars coming up, including Salary Negotiations for Nonprofit Professionals. Development position keywords to include might be: Cultivation/engagement, Stewardship, Major Gifts, Grant writing, Corporate/foundation relations, Solicitation/closing, Annual giving, and more. Hot Jobs from the ConnectVA Job Finder: Director of Development with Shalom Farms and Director of Supporting Organizations and Celebrations with the Science Museum of VA. Here is a Case Manager resume template from QuintCareers. Check out these helpful executive resume templates from the BridgeSpan Group. Executive Director position keywords to include might be: Strategic Planning, Fundraising, Board relations/governance, Leadership/vision, Management/supervision, Partnership-building, Public speaking, and more. Take time to customize your resume based on the job description of the role you’re applying to. This may go without saying, but don’t use the same version of your resume for each job application. Take the time to highlight and emphasize specific skills on your resume based on the needs of that organization. The “Objective” is dead. Write a Summary of Qualifications or Professional Profile instead, with 3-5 bullet points summarizing your most impressive skills and accomplishments. Use one of those bullet points to explain your interest in/passion for the organization and how it fits in to your professional development goals. Write a cover letter from the heart. If you want your cover letter to be read, avoid the standard template that everyone in HR has read multiple times. Take the time to research the organization and share anecdotes about your personal and professional experiences that will grab the hiring manager’s attention. Easier said than done? Check out this article with case studies from the Harvard Business Review. Have other people in your network read it before you submit. Burning the midnight oil to get an application in before the deadline? Try to make time in the morning to reread it, and better yet, have a friend or colleague read it, before you press send. You’ll have a fresh perspective in the morning. Use LinkedIn. Be sure to check your profile for accuracy before you begin applying to positions. Recruiters are checking your online presence, and having a LinkedIn account is essential. You can also use LinkedIn to research the right Point of Contact for your cover letter, and to learn more about the organization. ConnectVA is the go-to source for Richmond metro area nonprofit jobs. Find your next job in our Job Finder.